Tucked away in the depths of the country this is an ideal spot for a celebration or party. Superb period properties ideal for large family gatherings, group accommodation and large parties or as a stunning wedding venue beautifully furnished with fantastic spacious living areas. This holiday cottage combination is quite literally breath taking with spectacular rooms heavily beamed, contemporary touches and a bespoke table to seat all your guests in the wonderful dining hall. These rural cottages are surrounded by farmland. Ideally located just an hour and half from London and close to both historic Faversham and the popular seaside town of Whitstable there will be lots to do during your stay! Each property has been immaculately furnished and finished to the very highest standard. The spacious accommodation combines the wonderful original features of the converted barn; period beams and cosy log burners, with stylish modern twists. Great Higham Barn is a truly stunning barn conversion of a very early Kentish barn dating from the 1600's. The rooms make the most of the wonderful oak beams found throughout the building and a mixture of contemporary and antique furniture adds a quirky but comfortable touch. Large plush sofas abound in the seating areas which are scattered throughout the building so groups can sit and share those special holiday moments whether in the kitchen, the galleried play area or the more formal sitting room. 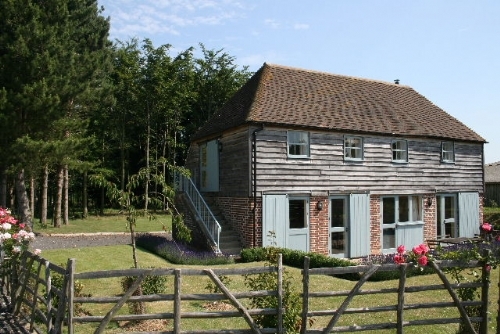 A particular feature of the barn is the annexe which can be used as part of the barn (it has an inter-connecting staircase) or separately with its own front door - ideal for members of the party who perhaps are looking for a little privacy. The very spacious excellently equipped kitchen and cooking area is split into areas at the heart of the building, ideal for preparing for even the largest of weddings or holiday parties. Why not read all about Lauren and Dan's Great Higham Barn wedding here. Great Higham Oast is a traditional building recently been beautifully renovated to make a comfortable and spacious home from home, great effort was also made to retain the house's character. There is a bespoke oak and granite kitchen and traditional tiled floor. The rooms themselves are spacious and light with a wonderful open plan kitchen dining and living space with doors onto the sunny south facing patio. In addition, there is a cosy living room with large plump sofas and a log burning stove to while away those chilly evenings. The cottages lie on a private farming estate and holidaymakers are welcome to make full use of the estate and its 30km of woodland paths and bridle paths. 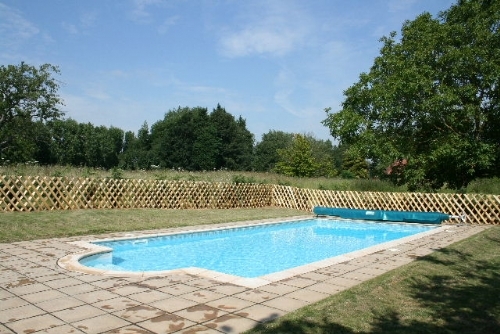 The cottage benefits from the use of a heated outdoor swimming pool (summer only), a tennis court and nearby riding stables. "I am writing to say how much we all enjoyed our stay at Great Higham Barn and Oast this week. We were very impressed with the buildings, facilities and the thoughtful way everything we needed had been provided. Mandy and her team had done a superb job preparing, cleaning and making us feel welcome. It was a joy to be there and I hope we will find an opportunity to return." If you can tear yourselves away from this wonderful spot and all on offer at the barn then there is lots to see and do in the area. Leeds Castle with Go Ape, Segway and the stunning grounds itself is within 20 minutes, Canterbury Cathedral and St Augustines Abbey are also within easy reach and if you fancy a brewery tour, Shepherd Neame is based in nearby Faversham. Great Higham Barn: sleeps 18 + 8 in 7 bedrooms, 2 sofa beds and 4 futon beds in reception rooms, 1 family bathroom, 4 en suite bath or shower rooms and 1 WC. Outside there is a private garden with large patio area and seating and private off road parking for several cars on the driveway or undercover. 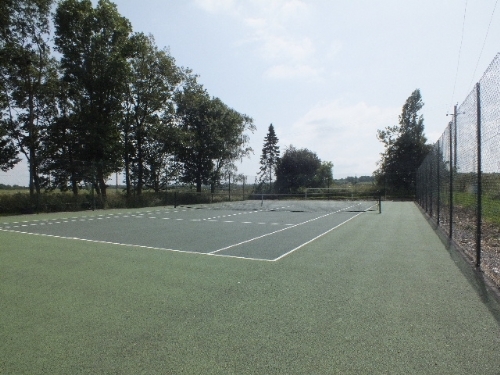 Use of shared outdoor swimming pool and tennis courts. The property is entered via the double height barn door which leads into a double height glass walled atrium. Main dining area seats 18 with French doors leading to the rear patio area. Kitchen: split into three 'rooms' - the main cooking area, with sink, double range electric oven and extractor fan, two dishwashers and a large fridge. A second dining area overlooking the garden seats 12. The utility room has a washing machine and separate dryer. Double room (sleeps 2) double bed, en-suite shower room. 3 x Double/Twin rooms (sleeps 2 each, Doubles or Twin beds available on request) . Snug/play area (sleeps 8) 2 double sofa beds and 4 futon beds sleep the extra 8 guests. All forms of digital music are catered for. USB link for iPods, and most smart phones, iPads, MP3 players via USB link or phone jack. DAB radio and CD, iPod, iPhone, iPad, docking station may not be compatible with some iPod classics. 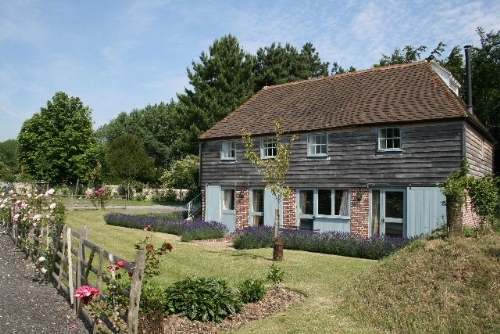 Great Higham Oast: Sleeps 10 in 4 bedrooms, 1 reception room, 2 bathrooms (1 ensuite) and 1 WC. Outside there is a south facing patio with seating for 10 and a BBQ and further outside space to the rear. Under cover car parking for two cars is available. Sitting area: Open plan, TV / DVD and Sky TV are available. Kitchen: With granite work surfaces the kitchen is equipped with dishwasher, fridge, freezer, washing machine, electric oven and hob, microwave and extractor fan, the adjoining dining table seats 10. Family bedroom (sleeps 4) 1 double bed and 2 single beds and a wood burning stove. Underfloor heating throughout both properties. All forms of digital music are catered for with USB links for most MP3 players. DAB radio and CD player also available. This is a carbon neutral development and all heating is supplied by the estates own coppiced woodland at no charge to the holidaymaker. In addition, much of the electricity comes from a renewable source. All logs for the wood burner are provided free of charge. Dogs and cats are welcome as long as they behave themselves. Guests use the hot tub and pool facilities at their own risk, and due to harsh chemicals used for maintenance purposes some skin types may react. Guests who are using Great Higham Farm as a celebration venue should be aware that music is only permitted until midnight.. Please be respectful of neighbouring properties and refrain from making any noise after this time. A service charge of £300 may be applicable dependent upon the use and group size. Please note fireworks/chinese lanterns are not permitted at this property. BBQ's are coal fuelled - The coal is not supplied.